We have 10 times the number of bacterial cells inside of us as there are human cells and most are in the gut! Fifteen years ago, we called it gut flora, today it is referred to as gut microbiota. I like to think of it as the gut ecosystem. It is influenced by the foods and beverages we eat (and over eat), the amount of stress we encounter, the quantity of water we consume, how much activity and exercise we do and any toxins that enter our bodies. In this blog, I recommend three ways to add more probiotics to your diet. Probiotics are beneficial bacteria. They are beneficial to gut health, immune health and overall health. They help keep our gut microbiota balanced and reduce inflammation at the same time. Probiotics, similar to antibiotics, have different structures and actions. It’s necessary to understand that probiotics differ according to the strain (variety), how they are prepared and the shelf-life of that preparation. Bifidobacerium lactis have been observed in clinical studies to benefit some people with irritable bowel syndrome, whereas stains of Lactobacillus casei can benefit children with infectious diarrhea and adults with antibiotic associated diarrhea. I recommend this probiotic chart resource written by my colleague and pharmacist Dragana Skokovic-Sunjic. It’s important to replenish our ecosystem daily with probioitcs. They can occur naturally in certain foods and beverages and they can be added as an ingredient. Let’s explore three ways to add more probiotics to your diet! 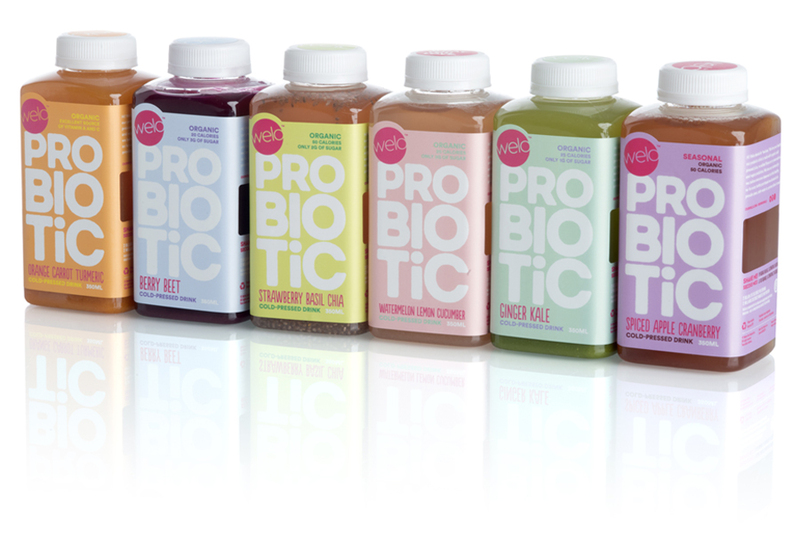 Welo Probiotic Drink is a new product on the market. In fact, Welo is one of my Innovation Guelph clients! It is a cold-pressed, vegan, organic juice with low sugar and no added flavours or preservatives. The probiotic in Welo is Bacillus coagulans – GBI – 30 6086 which is touted for improving protein and carbohydrate digestion. Welo is offered in a variety of flavours including Strawberry Basil Chia and Ginger Kale, so it’s easy to drink daily. Fermentation occurs when microorganisms convert carbohydrates (such as the sugar lactose) in foods to alcohol or acids. Nearly all food fermentations are the result of more than one microorganism, either working together or in a sequence, usually growth initiated by bacteria, followed by yeasts and then molds. Fermented foods may provide both probiotics and prebiotics that help maintain gut and immune health. Examples of fermented foods include yogurt, kefir, sauerkraut, and kimchi. Add some ferments today and your gut will thank you! Emerging research suggests that algae plants including seaweed, spirulina, cholerella and blue-green algae contain common probiotics. It’s thought to be part of the defence equation why these aquatic plants are fairly disease resistant when they are an environment with dangerous microorganisms. There is vast potential to better understand the probiotic benefits of these sea vegetables including new industrial importance and corresponding innovations. I’m still not adding sea vegetables daily to my menu but this gives me more incentives to! Current findings suggest our gut microbiota can explain critical features of our human biology. It plays a larger role in human health and diseases such as crohn’s disease, heart disease and obesity than previously thought. More research and clinical trials will provide advanced details how the gut communicates with probiotics to support and regulate major immune functions important for body and mental health.